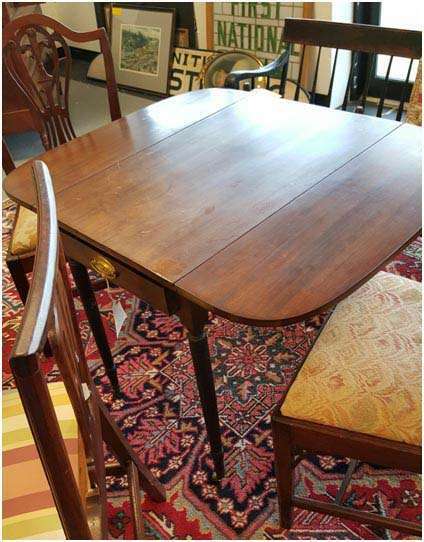 This is an elegantly designed Pembroke table, with delicately carved and fluted legs, rounded drop-leaf corners, and a slender apron. It is one of the few period pieces where the story of its naming has actual roots. Lady Elizabeth (1737-1831), the Countess of Pembroke is reported to having wanted a smaller drop-leaf table in her bedchamber. Its use was based on its appearance, a smaller version of a dining table. George Sheraton in his Cabinet Dictionary, published in London in 1803, states that it is a “type of breakfast table, from the name of the lady (Elizabeth) who first gave orders for one of them.” There have been also other uses for this table, such as tea, gaming, and even as a desk for writing letters. My own Pembroke table is presently being used as a lamp table by the side of a wing-back arm chair. The present beauty of these ca. 1820 tables is their very flexible use in today’s dwellings as in their early 19th century homes. ‹ Satsuma Bowl, Huge Stainless Milk Bucket and More!